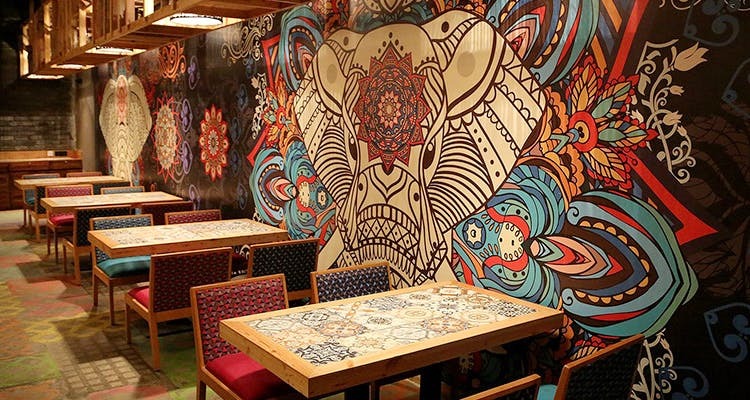 Quirky décor and authentic offerings from Kashmir to Kerala, we love that this really is a pan-Indian restaurant. There’s so much on offer it is easy to get confused, so like us, let the little toque beside dishes lead you to the chef’s specials. So the Palak Papadi Kebab or papad-coated spinach and cashew nut croquettes came first and set the bar high, but the Bheja cutlet – Parsi-style lamb brain cooked with coriander and chilli, really stole the early show. Prawn Balchao a spicy-sweet Goan dish was a bit of a disappointment, but Rann-e-Khas really made up for it! Coming off the bone easily and melting in the mouth, it was certainly the star all evening. Though there is Amritsari Chana Bhatura and Mangalore and Kerala specials, we were drawn to the Dal Makhani and Indian Kitchen Murgh Makhani. While the former was very rich, tasty and Bukhara-esque, the chicken was just a done-up version of good old Butter Chicken. Tasty but unexciting. For something more daring, pick the Kurle Ambat – sinful soft crab in a tomato-coconut gravy which will have you mopping up the gravy long after the meat is gone! Rotis, rice, appams and neer dosas are all up to the mark too. Ah the joy of not having an Indian restaurant resemble a Mughal palace itself is great. Then add on ornate yet quirky, rogue-looking elephants in vibrant colours and an interesting wooden panel with coloured bottles, kettles and lanterns, and you have a very spunky and lively touch. Oh, and ceramic tiles mixing up the vibes on every table. The food is good but what will certainly have us returning is the décor and service. And perhaps next time, we’ll stick to either starters or mains, as the portions are rather massive here. Siddharth Pujari, of City Bar fame, has really got it right, again. When: Sunday to Thursday, noon-3pm and 7pm-11.30pm, Friday and Saturday, noon-3pm and 7pm-1am.